I got the Office Survival Kit (Hers) by Touch of Ginger from my friend who just came back from London. Such a unique gift and so me! 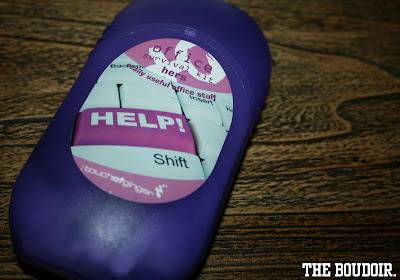 This hand size kit is in my opinion so useful and can be kept in your handbag for emergencies. It contains a nail file, lip balm, refreshing wipe, mints, moisturizer, sewing kit, cotton buds, cotton pads, make-up remover, and elastic hair band. There's also a "His" version of the Office Survival Kit and many other useful Urban Kits available on their website. I want to collect all the Urban Kits! This would make a nice gift or a gift add on.